Last year at the beginning of November we were just recovering from a bizarre October snow storm. This year we had another oddly powerful storm wreck havoc over our state, whose aftermath will need to be dealt with for a long time to come. It seems odd that people still debate the change in our weather, regardless of opinion, it seems wise to invest in systems which are not electrically dependent, or at very least, a working generator. Besides for November being a time to contemplate the ever changing climate of our world, it’s a time for cleaning up, finishing markets and beginning to settle down for the winter months. Infrastructure was improved upon and fields tidied up for winter. Extra hoops, remay, irrigation lines, etc. were cleaned up, labeled and stored or tossed if not suitable for use next spring. Administration was also a major focus, assembling end of the year wrap up summaries and posting on the website. November also marks my anniversary for arriving at North Slope, now three years later, I look at November as a pleasant month. It is a calm month of finishing up to prepare for the coming holiday season. The weedwacker needed some attention, a new starter pulley was needed but successfully replaced. The crew moved the old, broken down box truck to its ‘final resting place’ by the farmhouse and 579, the truck had to be hauled by tractor since the engine does not run any longer. KG and RR also began training on tractor, rototiller use and had to take the BCS tire to be fixed. End of the year summaries were worked on; greenhouse summary, harvest and market summaries, a winter market summary/proposal and payroll. There was work on the website and summaries were added. Also there was continual clean up of office odds and ends. 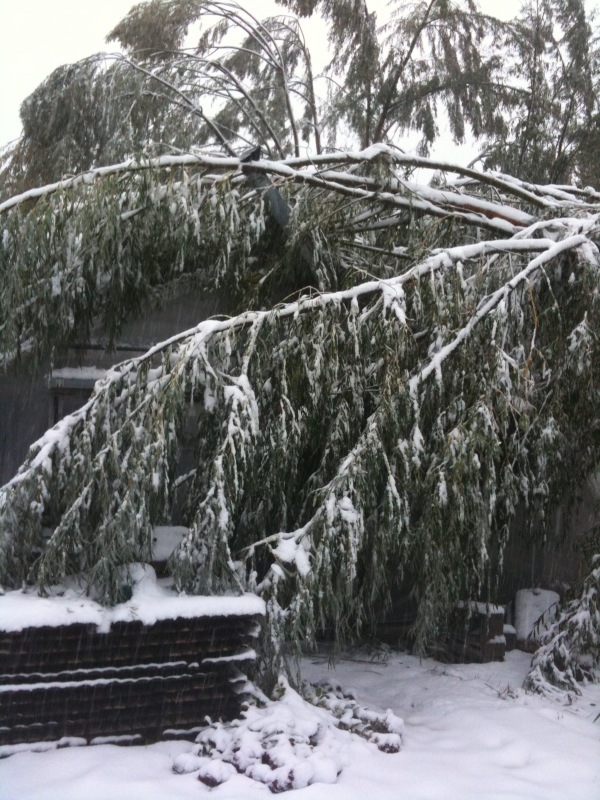 The end of October snow storm left snow to shovel and structures to uncover and fallen trees/branches to clear away. The snow also knocked out the power, which returned at the beginning of the month, allowing us to run water and refrigeration again. However, with the cooler temperatures, especially at night, the water situation has to be continually monitored to make sure pipes won’t freeze. Screens on the farmhouse porch were measured and paneling was cut to fit in to create a ‘sun room’ on the porch and to help heat up that area to add to heat trickling in from the outside to heat the house. General upkeep on the farm was a continual effort, with jobs like fixing fence line and trimming overgrown plants and branches. The chickens also needed care, feeding, coop moving, etc. Clearing out of old seedlings and bringing potted perennial plants into the heated greenhouse for over winter. The greenhouse tomatoes were also cleared out and hoops were cleared from the farmhouse gothic. Also, table tops were set up and seeded in the heated greenhouse for winter production again. Woodchips and manure were piled up for future seasons, several loads of horse manure was brought in from a nearby horse farm. The garlic order was cancelled so North Slope provided all of it’s own seed for 2012 garlic. Planting the garlic went well, the ‘garlic challenge’ game was created to test who can consume the most fresh, raw garlic. Some final BGBs were also prepped and seeded with spinach, covered and left for spring. Also, cover crop was spread over fields for the winter. And heated greenhouse tables were prepped and seeded for winter production. Blackberry plants were staked, a bit late as they should have already been trellised at this point to help control their wild growth but sometimes (more often than not) perennials get put on the back burner during the busy summer months. Fencing for small trees was also needed and set to help protect the young plants against deer and other nibblers. 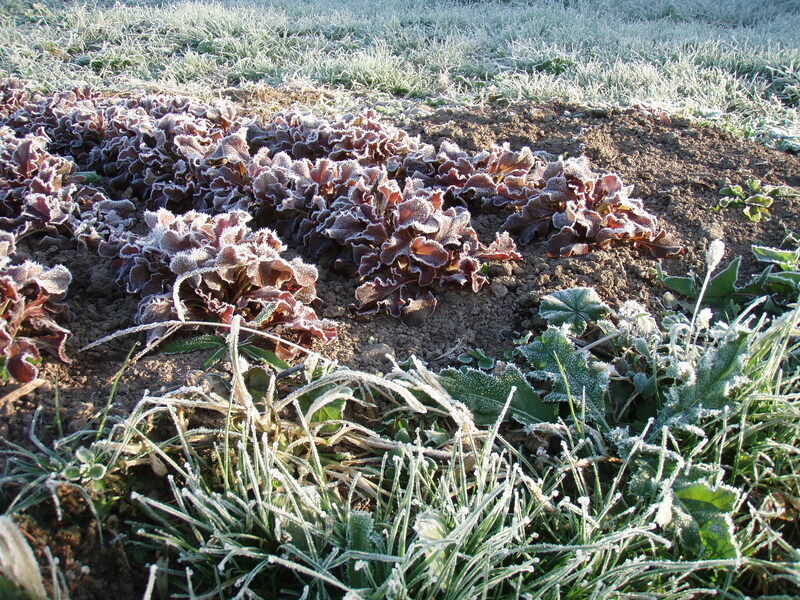 Some spinach, lettuce, carrot and kale beds were covered with layers of remay and/or plastic to help preserve into the winter and in some cases, next year. Remaining hoops, remay, sandbags, etc. were collected and stored for the winter. The harvest continued for end of the season markets and storage over the winter, including salad mix, radishes, scallions, kale, chard, a one time harvest of our enterprise apples, carrots, baby fennel, arugula and tat soi. Washing of roots and greens becomes a very cold job in November, cold air, burning winds and constant hand submersion makes for a chilly job even in the sunny afternoon. But the cooler weather of November does help one to appreciate the warmth from the fire in the bunk house. Egg washing continued, selling out at markets, eggs continue to be popular. And 1st years are trained on salad washing. The end of the season of weekend markets. West Windsor had their last regular market in October with a special market the weekend before Thanksgiving. With Thanksgiving comes, the end of the season and both weekend markets are over until the Spring. Hopewell continued, weather permitting, through the winter time but still by the end of November profits slow. However, cool customers that love the Hopewell market continue to visit and even bring gifts of old farming books from the turn of the century, very interesting to see how things change. Meanwhile, JR is trained on driving the box truck and taking on marketing tasks for the coming season. Panels for the farmhouse porch were installed to help heat the house. The seed shed loft was worked on. A chicken slaughter was scheduled at the Wilkinson’s property after Thanksgiving. The remaining flocks were consolidated with the healthiest looking birds left to over winter at the farm. The 11 birds which were culled were taken to be slaughtered and used by the crew for soup and other eating. We must give a big thanks to Matt Wilkinson for allowing us to use his equipment and teaching us how to do the job correctly. Week 2: A heat wave came in to give a break from the chilly fall, days up to 70s but a windy front brought rain and a change in weather. 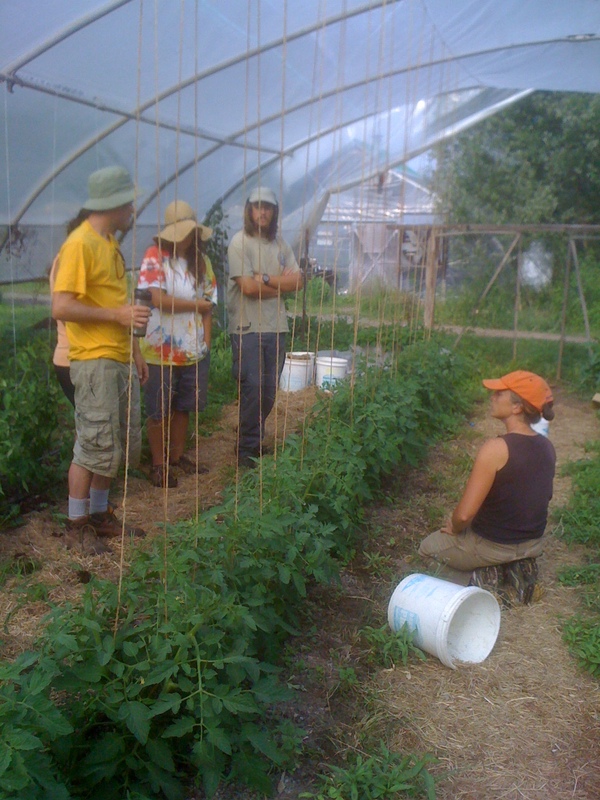 NOFA’s Twilight meeting about Farming with Interns was hosted at North Slope Farm on Monday, July 22nd. 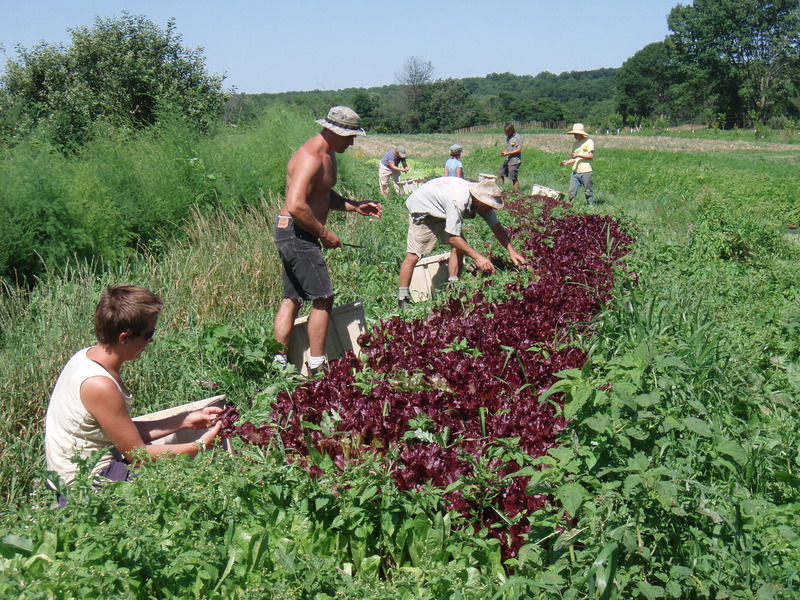 It was a friendly, laid back gathering of experienced farmers, new intern/farm workers and those who have recently discovered their love and interest in sustainable farming. With participants sharing in a tasty potluck the evening was filled with stories of farming experiences, woes and successes. The discussion focused on the need and draw backs of hiring inexperienced interns on the farm as well as fair compensation, including financial, living and learning rewards. The evening was wrapped up with a tour of North Slope at dusk. General Observations: Ahhh it’s June! This seems to be the thought of every farmer I’ve ever met come June. We all wonder what exactly happened to May and even April for that matter. The weeds are going crazy, some sneaky trickster must have fed all the worst of the weeds some sort of plant steroid…or perhaps it’s just because our days are at their longest and evolution has created a mighty plant foe in the field for us to either battle relentlessly or come to a sort of equilibrium with the deemed opponent. No matter the cause or the farmers stance on weeds, every farmer begins to look at the To-Do list grow while the Done list seems to pale in comparison. Ah well, I suppose it’s summer…oh wait, that’s right Summer Solstice! In the middle of the crazy heat and insanity that is June, North Slope Farm always tries to appreciate and honor the Summer Solstice. What better excuse for a celebration than the changing of the light levels and the passing from Spring to Summer. Equipment 88 hrs: Trackers are used for plowing, ripping, bed forming, cultivating and general use. Also equipment, like the Kubota and weed whacker, were used for mowing down weeds and cutting hay/straw for use on North Slope Farm. The Volvo needed work done, got a new starter motor…a lot of work has gone into the Volvo over the years which may indicate it’s on it’s way out. General maintenance was also needed on the IH140 which needed the battery connection cleaned. Administration 58 hrs: Pay roll, balancing check book, deposits, consolidation of invoices and general accounting management, what fun! Organic Certification Forms had to be filled out and turned in, don’t want to lapse on your organic certification or your asking for trouble. MR had a phone interview during the month of June. Seed orders for seeds we ended up lacking in had to be made to complete the year and irrigation rough drafts were made. Monthly summary, as always, were written and posted and photos were updated. Infrastructure 82 hrs: Continual mowing and weed whacking…lots of mowing and weedwhacking- perimeters of farm and fields, around buildings, greenhouses, etc. in a continual fight against the ever growing weeds (Darn those “plant steroids”). Fields were also continually mowed down for cut straw for mulching our field beds and using in our chicken coops. The chicken chores continued, moving coops weekly and general cleaning of coops and feeding, watering and collecting eggs always have to be done. Greenhouse 55 hrs: Stringing tomatoes in the greenhouse; continual/constant pruning of greenhouse tomatoes became a weekly chore. We also had to continue to seed the next succession of seedlings for the field. There was also trellising peas in Ralph’s House greenhouse. Composting 50 hrs: Many beds needed to be composted including beds in the 579 field for flowers, tea garden beds in the corner garden, BGBs for direct seeding salad mix and out in Veg B Mid for the next succession of transplants. Compost sifting for the greenhouse was also a continual chore. Planting 73 hrs: Lots of planting needed to be done in June, including direct seeding flowers in the 579 field. Also, soyo long cucumbers (yum) and yard long beans (yum yum) were direct seeded in the greenhouse. Additionally, 1st years were given training on direct seeding salad mix in the BGBs, including training on proper mapping and recording of work done. Also, lots of transplanting was done in Veg B Mid, scallions, red beets, gold beets, chard, touscano kale, red Russian kale, basil and summer squash while green beans, turnips and radishes were directly seeded there. The last of the tomatoes, eggplants and peppers were also transplanted out in the tomato field. We cleared out space in the greenhouse of all these transplants just in time for us to fill it again with the newest seedlings for the next veggie succession in the field. Crop Care 184 hrs: Weeding, weeding and more weeding. There was also staking and stringing of tomatoes and mulching their beds and lots of pruning of tomatoes in the greenhouse. The 1st years got an introduction to the irrigation systems for directly seeding in the BGBs and how to use the moisture system to check levels in the Farmhouse Gothic for proper irrigation. Irrigation had to be continually kept track of because the rain during the month was variable and often came all at once, quickly followed by long hot days that rapidly dried field beds. All of which was followed up with more weeding…of peas, carrots, salad beds, strawberries, and every other field bed. There was also cutting of hay from fields for hay/mulch. Harvesting 170 hrs: Lettuce, spinach, turnips, chard, kale, strawberries, peas, squash, garlic scapes, parsley, beets, radishes, garlic and flowers were all being harvested in June. A hot and humid heat wave spurred longer lunches and extended work days into later evening hours when it was hopefully mildly cooler. One afternoon/evening the crew struggled to keep going to gather and store bales of hay that had been cut. Everyone was loosing incredible amounts of water due to sweat in heat and high humidity but finally finished a long day, getting all the hay stored safely and dryly in the seed shed only to have a storm blow in 15 minutes later, redeeming all the work done to save the hay from being soaked. The thunderstorm also brought a more than welcome break in the heat and a needed shower for all crew members who had bits of hay sticking to every inch of skin. Additionally, there was also a one time picking of mulberries from single mulberry tree-yielding 5 pints in one hour of picking. But the tree also was hours of entertainment for not only children of workers of the farm but workers themselves-nothing quite like a mulberry break in the mists of a hot day. Handling 47 hrs: As always, washing of greens and roots. For the first time we broke up Friday washing with Thursday, hoping to reduce the pressure on Friday and maybe break up the day into doing different work in the afternoons. An overview on washing was given by MR and washing eggs was a continual chore. Seedlings for orders from the Whole Earth Center also had to be collected and delivered. Marketing 149 hrs: In the middle of a month where fair or foul weather can make or break a market, Wednesday Hopewell Farmers Market experienced quite a number of rainy days or days suffocated by heat and humidity, which majorly impacted the number of customers who came out. Also, Cherry Grove Organic started at the Hopewell farmers market in the month of June. MR began to coordinate mushrooms and Solebury Orchard orders for market, in mid-June there were the first apricots and sour cherries. Also, the special order with Kitchen Garden seedlings was delivered, total came to $487. 6/16 the farm stand opened for first time at NSF. Special Projects 22 hrs: ST’s Black Bird Meadows continues, tracking becomes of greater importance as bed forming, staking, mulching, planting continues. ST also experiences having to get rid of seedlings which became root bound after they did not make it into the field. NOFA NJ came to observe sun hemp as a cover crop at NSF, taking measurements to see how sun hemp fairs under certain treatments. MD and ST take measurements of the newest field, mulch field south east, to lay out the field perimeter and began to chisel plow. MD introduced workers to the log splitter and crew started work on clearing a stack of logs from the forest and stacking for firewood for winter use at the farmhouse. Also, RC lead up crew lunches in the afternoon. An open invitation to women interested in food…farmers, chiefs, friends and anyone who is curious is welcome to join us on February 4th at 6pm for a potluck dinner. This casual gathering is a chance to meet and reunite with other women in the general area. Since it is a potluck, bring your favorite dish, drink, something to share so we can all feast at the end of the week. Network, relax, have fun. Hope you can make it. Questions? Please email robincm510@gmail.com with Girl’s Night in the subject line. General Observations: As we rehash last November, I am reminded of my own arrival at North Slope. My beginning marked the end of two other interns who we sadly said farewell too as they ventured westward. Last year we were winding down and getting ready to pack it in for the winter, most workers had plans of travel in December and taking a nice long break from farming. But for those still here there was work getting the heated greenhouse in order for winter salad production, settling the chickens in for their winter stay in a new greenhouse and preparing the farm for a little break. Administration 31.5 hours: Monthly summary, end of the year summaries, bills for the year, payroll, meetings on plans for the end of the year/winter season, trainee meetings on goals and successes of the year, winter caretaker responsibilities meeting, 4th Quarter report to NJ. Infrastructure 18.5 hours: Completing greenhouse covering for winter space for chickens, patching greenhouse holes and heating problems before the winter, shutting down the walk in and setting up winter storage in a smaller refrigerator unit, winterize the farm and draining the water system. Greenhouse 12 hours: Preparing the heated greenhouse for winter seeding/production, fixing heating problems and holes in greenhouses. Special Projects 56 hours: Getting the chickens homes ready for the winter – Installing fence and BD finishing the framing on Farmhouse Gothic greenhouse. Excellent job by BD despite taxing conditions and fabrication requirements – Thanks BD! General Observations: We start off this month remembering that we are in the full swing of summer, with a 100+ degree day, I thought it would be a good time to sit in the air-conditioning to do the monthly summary for July. Last year at this time we were just coming off of one terribly rainy June and getting quite excited for the warmer, dryer conditions (ironic because this summer we are wondering when the rain will come and cool us down). There was also dreaded news of Late Tomato Blight in neighboring farms, creating quite a challenging month. Crop Care 115 hours: Thinning of sunflowers, stringing tomatoes, irrigation (laying tape and running), rototilling, trellis cucumbers, weeding sides of tomato beds in preparation of mulching and irrigation, ralph house clean up, weeding, weeding and more weeding: everything from tea beds to garden beds and north veg field beds. Week 1: red and gold beets, swiss chard, field salad, heliopsis, kale, purslane, rudbeckia, summer squash, turnips, teasel, yarrow, zinnias. Week 2: basil, red and gold beets, swiss chard, field salad, garlic, heliopsis, kale, pulled peas and trellis, rudbeckia, summer squash, yarrow, yellow dock, and zinnias. Week 3: basil, beans, red and gold beets, Echinacea, swiss chard, field salad, kale, and summer squash. Week 4: basil, red and gold beets, swiss chard, apples, pears, field salad, heliopsis, kale, summer squash, sunflowers, teas, cherry tomatoes, and zinnias.